My husband doesn’t speak Spanish, nor for that matter do I. But nowadays (in London at least!) you can barely fall through the doors of any brunch serving eatery without coming across huevos rancheros. They’re fried eggs I announced. In tomato. With chilli. 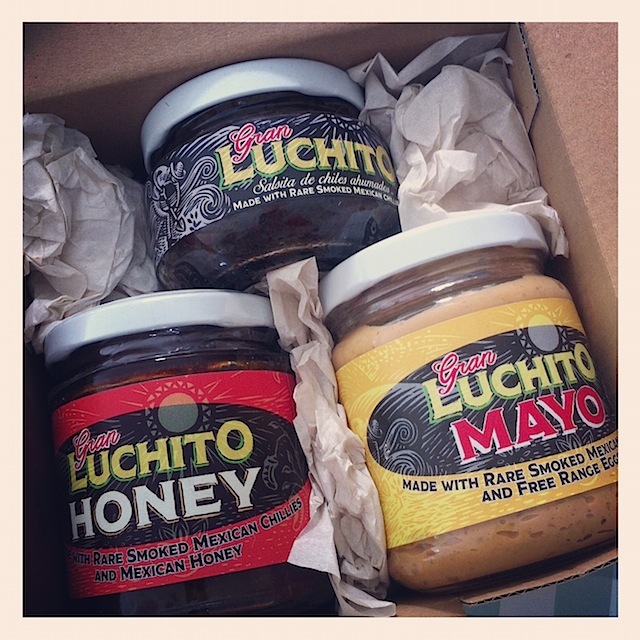 I had just tweeted a pic of these Gran Luchito goodies. I was determined they’d have a starring role in our brunchy lunch that day. The top one is smoked chilli paste, bottom left is smoked chilli honey (yes!) and the bottom right one is smoked chilli mayonnaise. They arrived in a box with a dried smoked chilli that I might have thrown away had Fuss Free Helen not prompted me to crumble it into something. I shudder to think I might have thrown this lovely object away!! 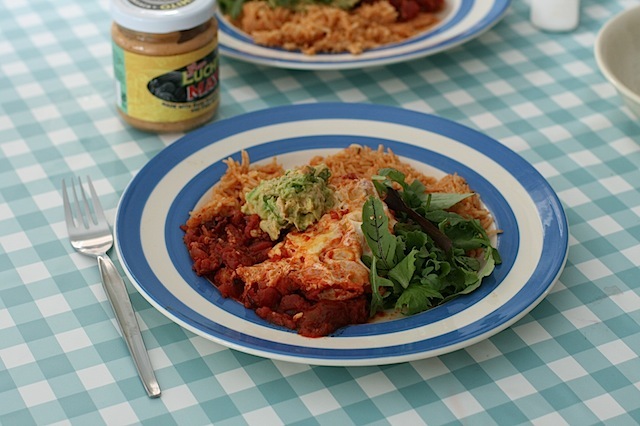 Now I don’t claim this is the ultimate huevos rancheros recipe, you can have them with refried beans and all kinds of stuff – but as with most things I publish, it’s made from what we had to hand in the fridge that day. 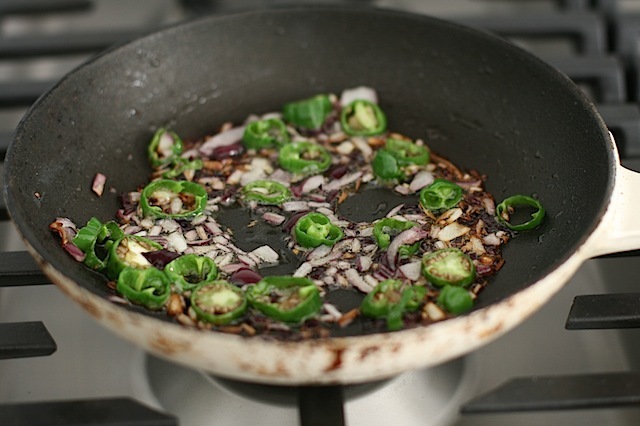 Take half a finely chopped red onion, fry in olive oil. I added two coarsely sliced padrun peppers for the fun of it, purely because I had some knocking about but seriously don’t go out your way to include these unless you fancy it. Ordinary peppers or some green chilli would be fine as substitutes. Pour in a can/tetrapak of 400g chopped tomatoes. Stir in half a teaspoon of Gran Luchito smoked chilli paste. If you don’t have this, you could use smoked Pimenton powder from the special selection stand in the supermarket as a substitute. Let the excess liquid bubble away for a few minutes. 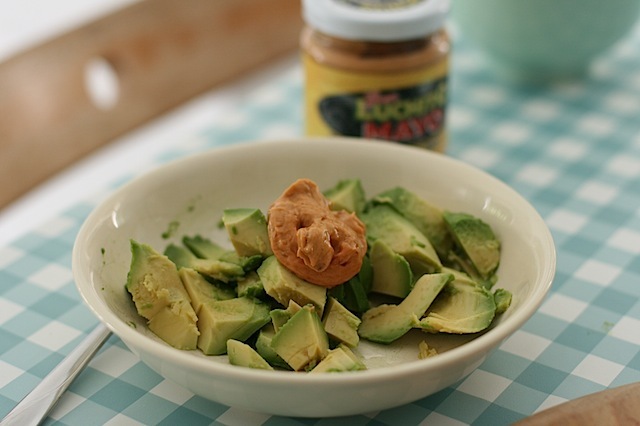 Mush half an avocado with a dollop of the smoked mayo. 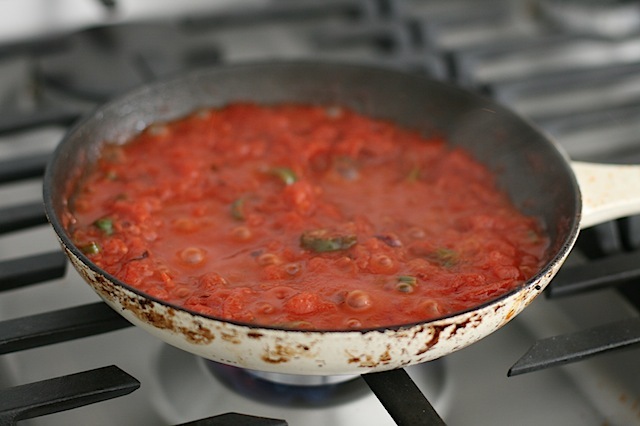 Once most of the liquid in the tomatoes has simmered away make a couple of hollows into which you pour your raw eggs. Now mine is messier than I’d like it to be but you get the picture. Once the eggs have set (covering with a lid will help them do this quicker) serve immediately alongside the avocado and some green salad. Traditionally you’d probably have it with some tortilla flat bread however I served mine alongside a trusty pack of Tilda microwave rice. 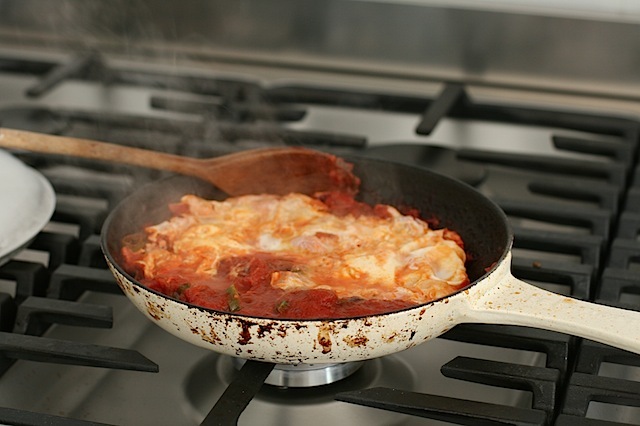 For a milder child proof portion, I fried an egg in the pan after the spicy tomatoes had been tipped onto plates. If your kids don’t like chilli then you could do theirs first and the chilli version afterwards. With thanks to Gran Luchito and Tilda for product samples. I so love their products. I really must get in touch with them. your dish looks great!